The North Dublin towers are numbered one to twelve starting at Red Rock Sutton Creek on the Dublin side of the Howth peninsula. All twelve towers constructed remain standing but only the tower at Howth harbour is open for viewing, being recently restored and now a Vintage Radio Museum. Seven towers are privately owned and 2 towers are located on offshore islands, Irelands Eye off Howth and Shenick Island off Skerries. During the tourist season from April to September, it is possible to visit the Islands by boat for a modest charge organised by the local boatmen at Howth and Skerries. Only four of the seven towers in private ownership are occupied (Sutton, Portmarnock, Malahide, Portrane) . Balbriggan, Shenick Island, Drumanagh, Howth Harbour Towers are under the jurisdiction of the Fingal County Council. The tower at Balbriggan is in a very poor condition with the entire top of the tower is missing. The Town of Balbriggan was ‘sacked’ by the Black and Tans during the War of Independence in the 1920’s and the extent of the damage to this tower would suggest that it may also have been subject to plunder in a reprisal attack but it was otherwise vandalised. 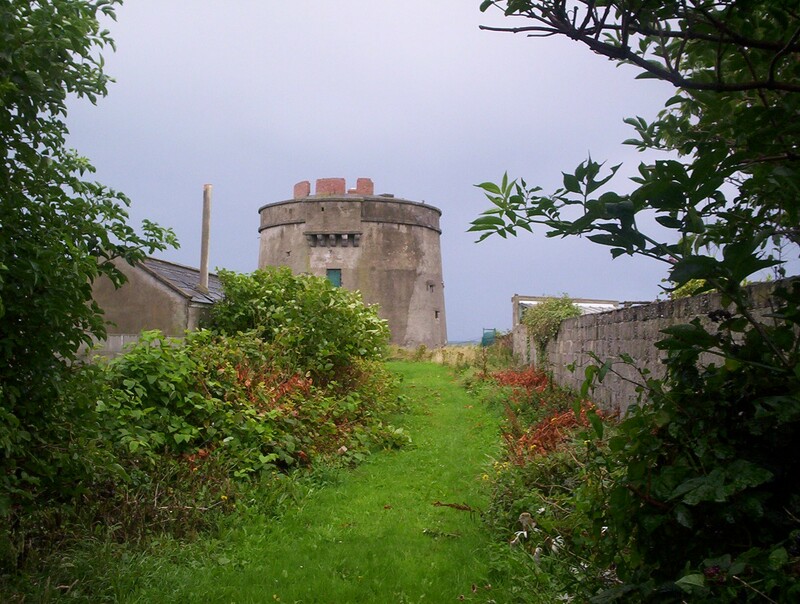 The Howth tower is the only North Dublin tower that was restored by Fingal County Council , it is now a Vintage Radio Museum and open to the public. 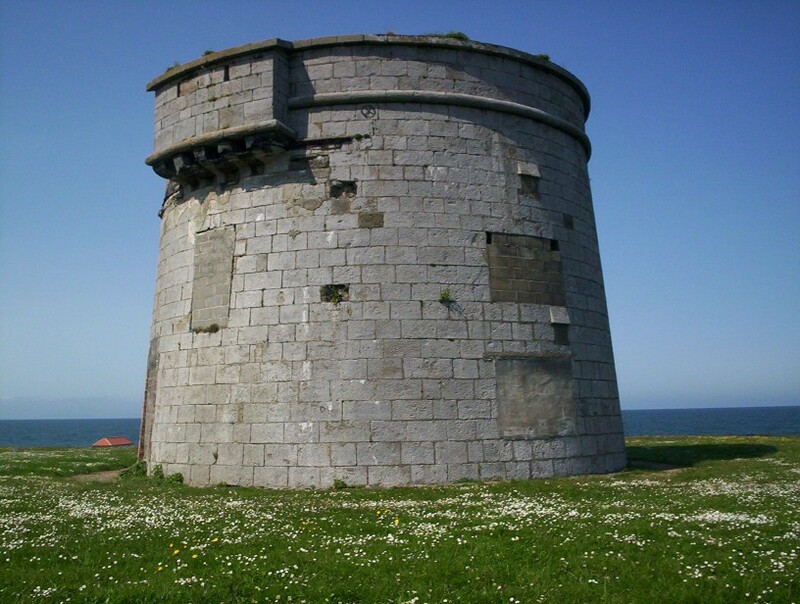 The historical records of the period circa 1910 include several Valentine collection photographs of the Balbriggan Martello tower in excellent condition. Howth peninsula is located 10 miles north-east of Dublin City and is steeped in history dating back to pre-Christian times when the Celtic Tribes called this peninsula Ben Edar. The Danes first used the name “hoved” meaning head, and is now recognised as Howth. Earliest references to Howth are found on a map completed by the geographer, Ptolemy in the 2nd.century. The remains of a structure on Howth summit is being investigated as the possible ruins of a signal tower that served as a semaphore communications link between the two Howth towers. Tower No.2 Howth Harbour,overlooking East Pier, entrance Abbey Street, opposite The Abbey Tavern. Lee de Forest,famous American inventor conducted Telegraphy tests here on November 30 1903. Howth peninsula is situated about 9 miles north of Dublin and on the high ground overlooking the harbour once stood the castle of St.Lawrence that dates back to the 12th.century. This is now the site of the Martello tower. The tower at Howth Harbour is the best known tower on the North side of Dublin as thousands of Dubliners visit Howth, Summer and Winter to ‘escape’ from the City and enjoy the relaxing walks on the Pier and stunning panoramic views north to the Mourne mountains and south to Wicklow Head. The highest point of the peninsula is over 560ft. and from here on a clear day, six south-side towers from Dalkey Island to Sandymount , looking across Dublin Bay, can be seen, with the aid of binoculars, Offshore is the third Martello tower Irelands Eye lying north of Howth Harbour and during the tourist season can be reached by boat operating from the East Pier. Its only buildings are the Martello tower and the ruins of a small church said to have been founded in the sixth century by Saint Nessan. When the harbour tower no longer had a defensive purpose it was handed over to the British Post Office and came to prominence in 1903 when the famous American inventor, Lee de Forest came to Howth on the invitation of the British Post Office and demonstrated his system of wireless telegraphy to P.O engineers transmitting signals to a similar station at South Stack lighthouse near Holyhead in Wales. The tower also became the terminating point of the underwater telegraph cable from Wales and a Marconi signal station and has justly earned a place in the records as having a historic link with the invention of wireless. The tower was eventually passed over to the Irish Post Office and eventually purchased by Fingal County Council who agreed to appeals from The Howth Heritage Society to have the tower restored on condition that the new facility would be made available to the Public for a museum, exhibitions, etc. Almost immediately, a renowned collector of vintage radios and gramophones in Dublin, Pat Herbert offered his large collection to be housed at the tower and his offer was accepted and has resulted in the present status of the tower being a Vintage Radio Museum and open to visitors. The historic association of the Howth tower with wireless telegraphy also continues in that local radio amateurs use the tower as their base Station and using the call-sign EI0MAR transmit from the tower making contacts with other amateur radio stations worldwide using voice and the morse code which is a unique experience for visitors, especially those that never before saw or heard morse code system in use. The site of the Howth Martello Tower was used as a trigonometrical station in the mid 1830’s during the early years of the ordnance survey. Joseph Portlock left a record of the elevation of polar stars of Howth measured by theodolite, a part of the work he did in measuring the trigonometrical skeleton of Ireland and in fixing geographical co-ordinates for latitude and longitude. There are more than half a dozen bench marks on the site carved for the most part on short stone pillars and several can be seen in the immediate area of the tower. The Howth tower was also used as a cable station. It was adapted by the Department of Posts and Telegraphs in the early 1920’s as the landfall station for the under water cable which crossed the Irish Sea. It continued as a station until it was decommissioned in the late 1980’s. To prevent water seepage (rain) some windows are being replaced and resealed also maintenance on Tower roof and extensive damp-proof protection surrounding the entire perimeter of the Tower. Previous drainage system is also being excavated and replaced. This preservation work by Fingal County Council Building Section is to be congratulated. Work entails removal and replacement and resealing of this main window. Restoration of chamber(s) over main entrance for 1. Supply of ammunition for cannon and 2. Furnace for heating shot capable of setting fire to enemy wooden ships sails and sails. The tower on Ireland’s Eye, a small Island off Howth Harbour is one of the largest ‘double’ towers constructed in Ireland having four machicolations with two 24 pounder guns. All the towers north of Dublin were constructed of rubble masonary and the passage of time has shown many cracks and discoloring of the surface plasterwork. The only other building on the Island is the ruins of St,Nessan’s Church, said to have been restored so many times: that little of the original building remains to-day. Boat trips to the Island are available during the Tourist season from Howth east Pier. 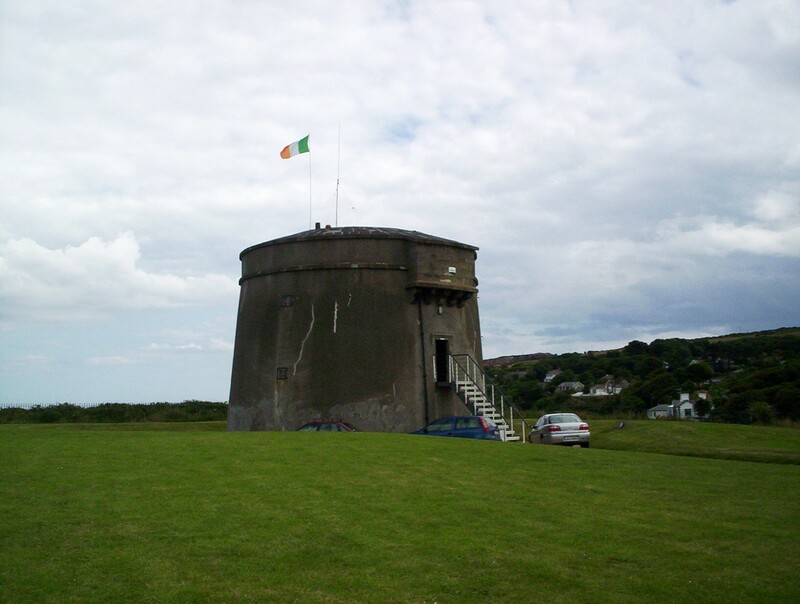 The tower at Portmarnock is a familiar sight to Dubliners who visit the popular sandy beaches of the Velvet Strand. The tower is located at the start of the coastal walkway to Malahide and on this route one will also see the tower at Robswall, Malahide. The War Department leased land for its construction and after the threat had passed it was handed back to its owner who sold it in 1923 to Ambassador Simpson of the United States for use as a holiday home. The circular ‘conservatory’ was built on top of the tower about this time. From 1954, a new owner used the tower to accommodate staff of a nearby hotel and the last and present owner is Breda Nagle. Further additions have increased the space for adequate living accommodation and it is welcomed that the tower is being well maintained rather than be left to decay and neglect. Several other north side towers located at seaside resorts can only be described as ‘eyesores’. In 1930 it was from the Velvet Strand, Portmarnock that the Southern Cross, piloted by the famous aviator Major Kingsford Smith with co-pilot Mr.Vandyk, wireless operator Stannage and Irish navigator, Captain Patrick Saul flew to Newfoundland to achieve the second East to West airplane flight in aviation history. An estimated 10,000 onlookers were present to witness this daring and historic event. This was followed in 1933 by another historic flight in aviation history when Jim Mollison, husband of the famous woman pilot Amy Johnson also took off from the Velvet Strand in his De Haviland aircraft The Heart’s Content to attempt the first East to West solo non-stop crossing of the Atlantic. He achieved the crossing but was to land in a field near St.John’s, Newfoundland and made aviation history. Further along the coast road is the Martello tower known locally as Hick’s tower as it was Frederick Hicks, an architect that became owner of the tower and tastefully restored the tower in 1910, adding more windows, a slated conical roof and castellated walls to enhance the appearance of the property. The tower is still in private ownership and continues to be well maintained also the gardens as seen below. Similar to other towers of this design, the walls are 6 feet thick and the main storage area for ammunition was on the ground floor. This comprised of gunpowder, cannon balls and great care had to be exercised to avoid accidental ignition of the explosives. A feature of all towers was that no nails were used, only wooden pegs, in case a spark from a soldier’s boot would ignite the gunpowder. The first floor entrance was about ten feet off the ground, accessed by rope or wooden ladder. The first floor was the general living and sleeping quarters where there was an open fireplace and cooking stove. Sleeping accommodation was probably collapsible type bunks or hammocks that could be stored easily after use. Entry to the roof was by way of a stone cut stairs cut into the tower walls on the part of the tower facing inland. The roof was surrounded by a parapet and a centre iron pivot and inner and outer tracks allowed the 24 pounder cannon mounted on a wooden beam carriage to rotate the full 360 degrees. 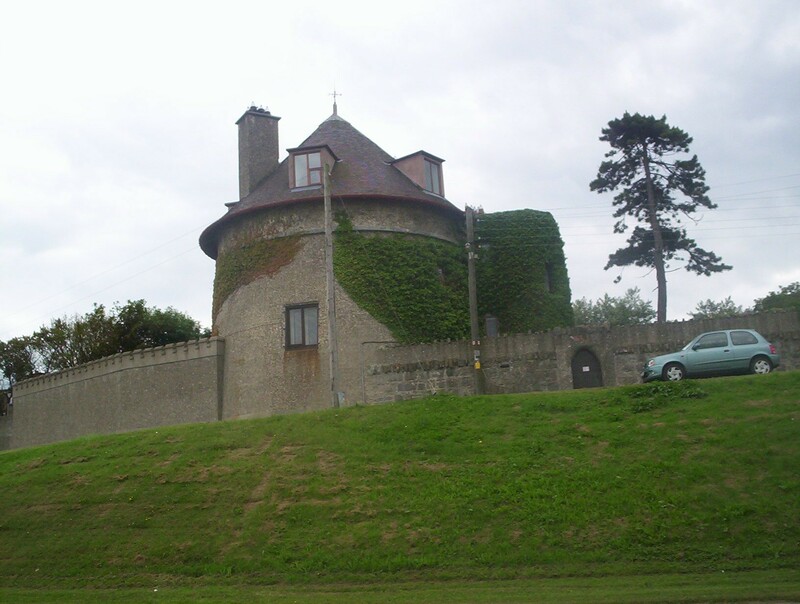 The name of the Malahide tower is often described as Robswall and is not to be confused with Robswalls Castle nearby which was once occupied by the Cistercian monks of St. Mary’s Abbey, Dublin prior to the suppression of the monasteries early in the sixteenth century. The castle, resembling a tower house has no history of any defensive purpose and local historian’s record that it also acted as a lighthouse service, when at dusk; a fire was lit on top to guide the fishermen home from the sea. (Ref.Malahide Historical Society). Tower No.5 Balcarrick, at entrance to Donabate Beach, North County Dublin. In 1803 an Act of Parliament to make provision for the proposed defences in England and Ireland, the compulsorily acquisition of land was passed for the building of the Martello towers. 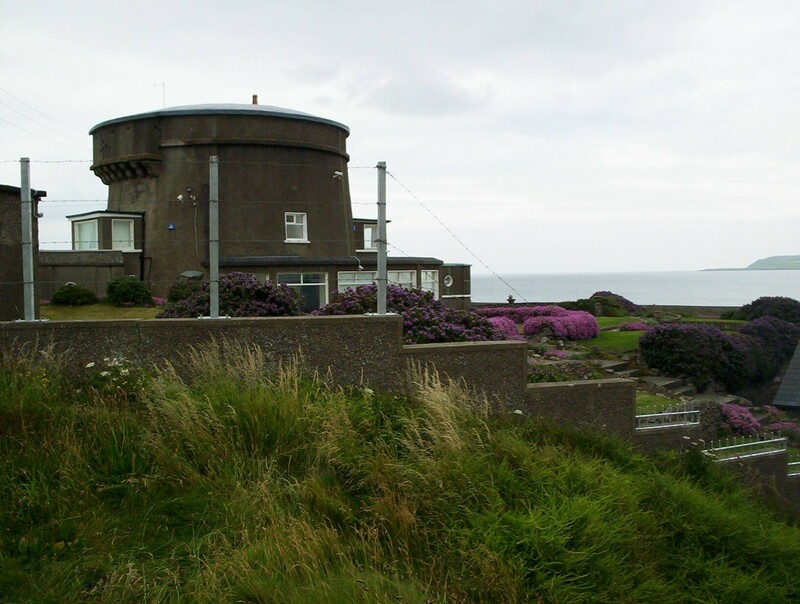 This authority was exercised by Colonel Benjamin Fisher, commanding the Royal Engineers in Ireland in the purchase of lands at Donabate and Portrane for the purpose of building a Martello tower in each location. would be one half an acre and with the right of passage ‘by a road to be made in the shortest, and most convenient direction from the high road to the Martello Tower, of a sufficient breadth for cars and other carriages’ (obviously horse-drawn). 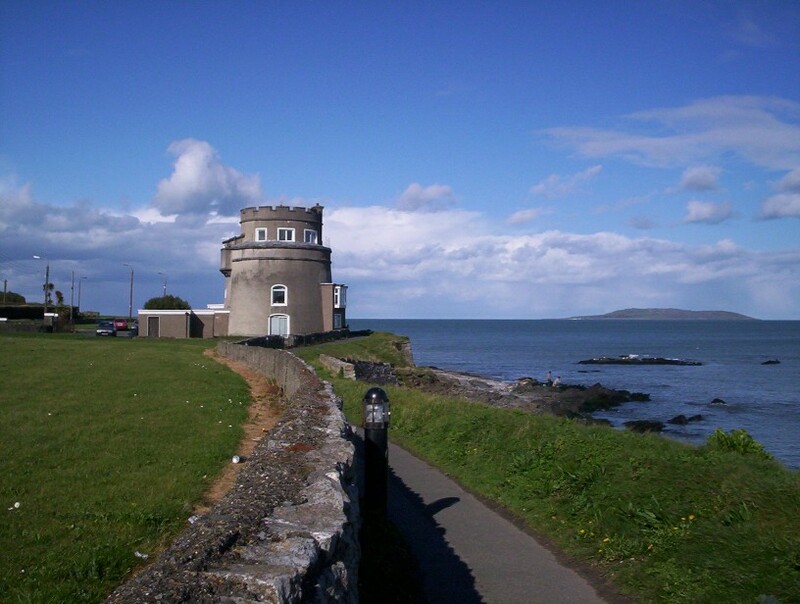 At Balcarrick, the tower is located at the entrance to Donabate Beach and one must appreciate that the tower was built before the existing wide entrance road to the beach and large parking area was built. Built on the rocks, it has since become almost encircled by a sand bank and is in a very poor condition. The entrance door and windows are blocked up and at some stage a circular battery type building, now in ruins, was built on the roof and adds to the unsightly appearance of the tower. On entering Donabate village (from the slip-road leading from the main Dublin – Belfast road (M1) , 2 miles north of Swords) there is a fork in the road. Take the right for Donabate Strand and the left for Portrane and keep right where the road rises to a car park at Tower Bay where the Portrane Martello tower is located. The tower has been converted into a dwelling house at great expense by the owner by the addition of a large stone single storey conservatory and entrance hall. The grounds around the tower are cultivated in stepped gardens having a beautiful display of colour in spring and summer. 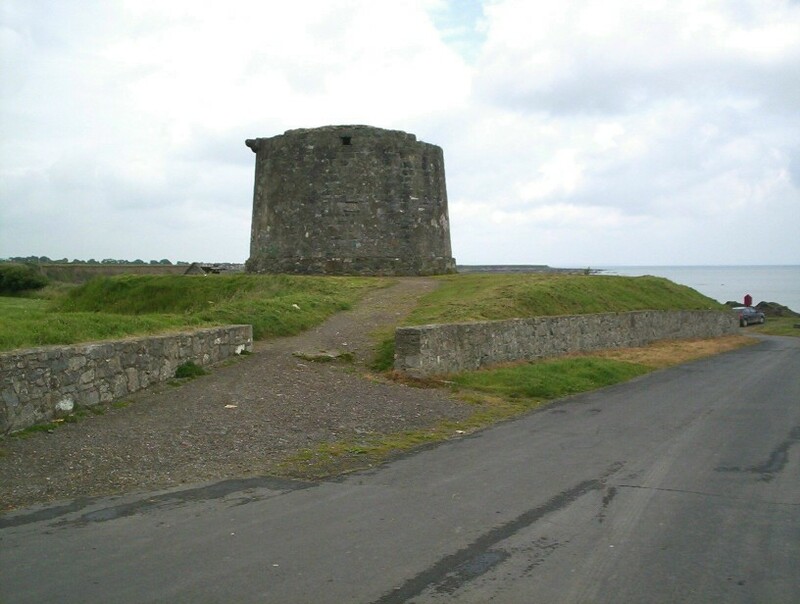 In his publication ‘A History of Donabate and Portrane’ a local historian, Peadar Bates has included photographs of the Tower during and after the conversion. The main bank is 400 yards long and as the promontory is surrounded by cliffs, the site was obviously well chosen for the location of the Drumanagh Martello Tower. The promontory is designated ‘protected lands’ and subject to further archaeological investigation. The Rush tower is located in an area now known as Hand Park (Tower Street), north of Rush Harbour and is almost encircled by modern housing, yet the immediate surrounding area of the tower is much neglected and it seems unlikely that any maintenance was ever carried out on the tower since it was built. Much of the plaster work in the area of the raised door is badly cracked and in places much of the brickwork is now exposed. Some of the features of this tower, inner stairs, fireplace and shot furnace, and especially the roof gun pivot may well be intact as there are no reports that this tower was ever used for any other purpose than originally intended except for a brief period from 1909 until 1920 when it was used as an Admiralty signal station. 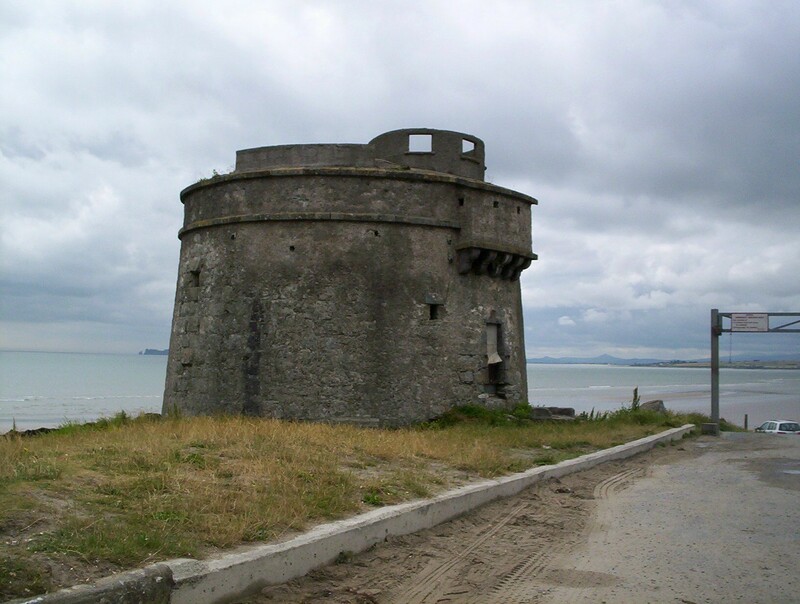 However, preservation of Martello towers as heritage sites was not a priority at this time and like many other Dublin towers were occupied during WW1 and by the Irish Army during WW2 as look-out posts. Red Island is now connected to the mainland by a roadway and this forms part of the quay wall of the Harbour. Local lore link the name to an industry in the Town of Skerries that dyed sails and this was called “barking” as the material used was the bark of certain trees and a pitch type substance called “cutch”. Big cauldrons filled with this mix were boiled over fires and a reddish brown liquid resulted, into which the sails were dipped. They were then transported to the Island and laid out to dry. Over a period of time, much seepige resulted into the soil and rocks causing them to become reddish in colour and gave the name to the Island. It is on record that the island was called Haven Island in the 17th.century. 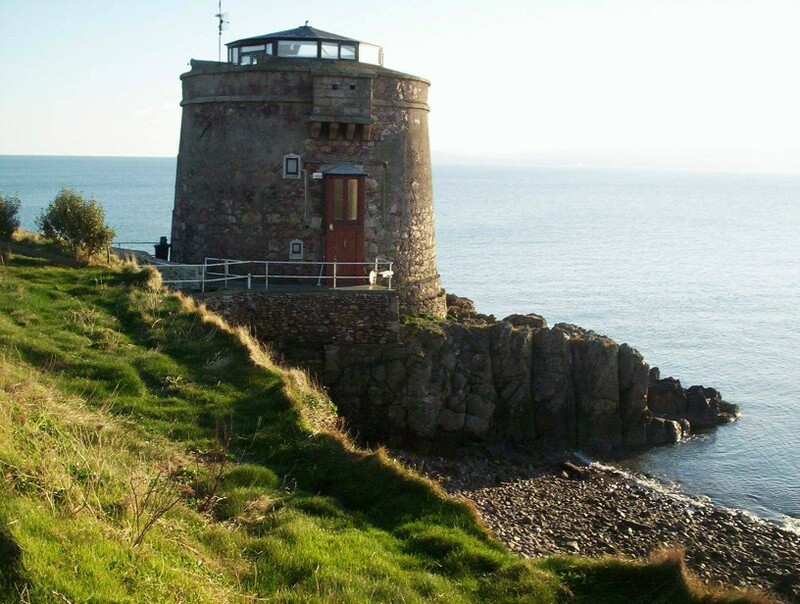 The Martello tower is located behind the harbour area, a prominent location adjacent to the coastal walk-way and surrounded by a well kept grassed area popular with holiday makers for having a picnic. In 1947 a holiday camp was opened on Red Island and during this period the tower was modified by adding doors on the ground floor and additional windows on the first floor and used as a tea-rooms , The camp buildings were demolished in 1980 and the tower remains but all doors and windows are blocked up and is not an attractive sight. 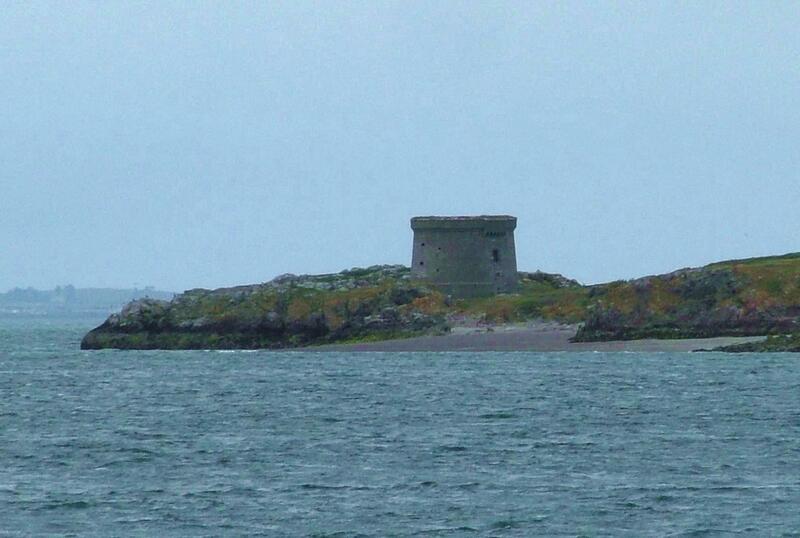 Tower No.11 Shenick Island, offshore Skerries. 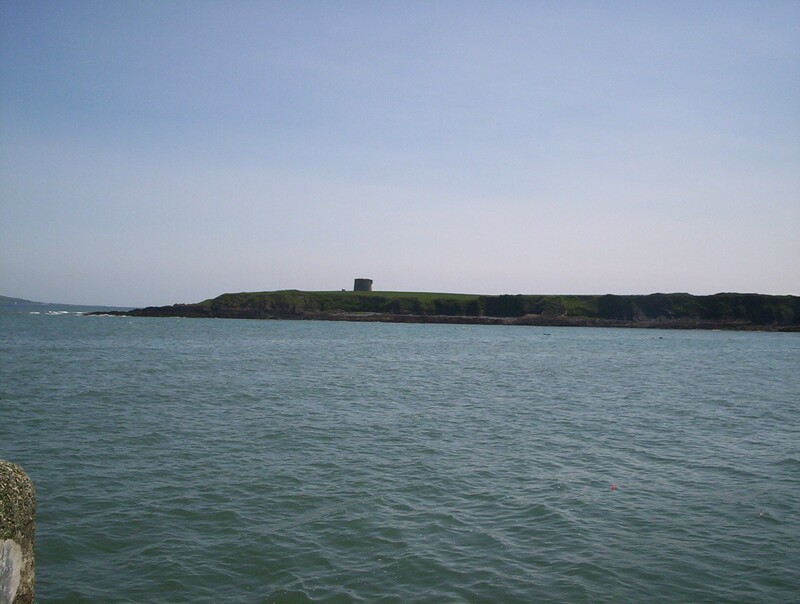 Shenick Island is the largest of the Skerries islands and gets its name from the Irish name for a fox “sionnach . 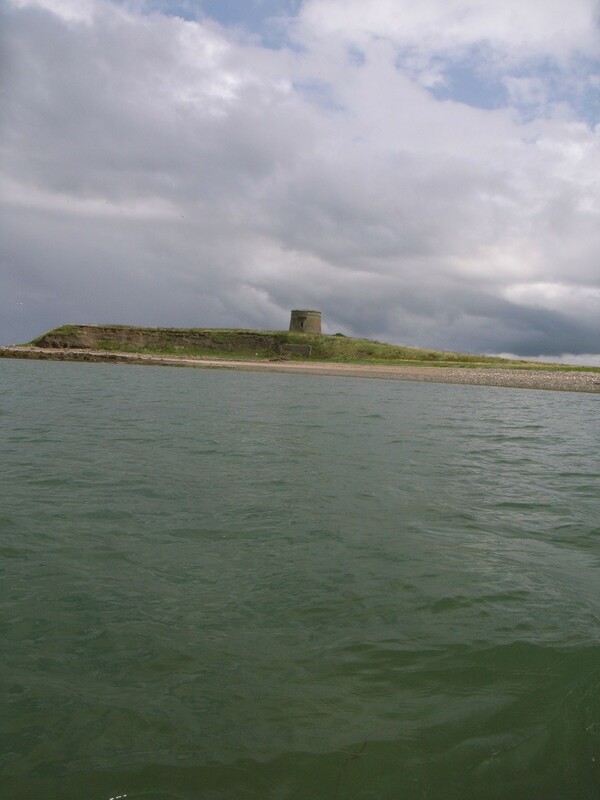 The tower on this Island is also in a strategic position and can be seen from several other towers to the south of Skerries. Little is known of its past uses, if any, since 1987, the Island was designated as a wild life reserve run by the Fingal Branch of the Irish Wild bird Conservancy Council. The most northerly of the towers constructed on the Dublin coastline can be seen at the Black Rocks, Balbriggan close to the Town Centre. Nearby, in ruinous condition, are two boat houses, the larger was used for many years as a Sea Bath House, and was much frequented by visitors to the town. The nearby park was once the site of an imposing Coast Guard Station built around 1864, and destroyed during the Irish War of Independence in 1922. This tower is the most ‘ruinous’ of all North Dublin towers and the entire top of the tower including the machicolation have vanished. The tower overlooks King’s Strand and an early 1900s photo from the Valentine Collection (Courtesy National Library of Ireland) shows that the tower and nearby Bathhouse was in very good condition at that time. Another excellent photograph of the tower also taken from the Black Rocks shows the ruinous condition of the tower as it is to-day. (Courtesy Tony Healy, Photographer, http://www.Balbriggan.net where many more period pictures can be viewed in the Websites Photo Gallery). The Website contains an excellent pictorial and historical record of this town and features the Railway, the Coastgaurd station, the sacking of the Town during the War. The Richmond Tower at Millmount, Drogheda. About 12 miles north of Balbriggan lies the town of Drogheda, County Louth, where the River Boyne enters the sea . On the south bank of the Boyne, Millmount Fort dominates the skyline . Due to its high location all approaches to the town can be seen from the tower including the impressive viaduct bridge that carries the Dublin to Belfast rail line. The tower was built in 1808 and the history of this site goes back many centuries, the building of the tower on the demolished ruins of the old fort did not change the new defences of Millmount being described as a fort. The Danish king Thurgesius is thought to have erected a fort here in the ninth century and historians believe that a fort was built centuries earlier. Hugh de Lacy, an Anglo-Norman built a motte here in the 12th century and it was later replaced by a fortified castle. When Oliver Cromwell invaded the town in 1649 its occupants put up fierce resistance. 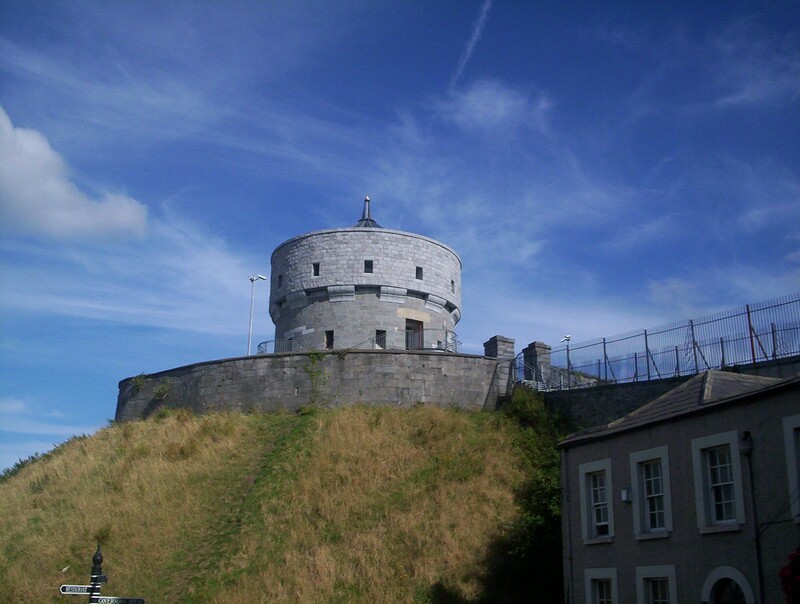 The tower was bombarded by the Irish Free State soldiers during the Civil War and has been fully restored by Drogheda Corporation. The old barrack buildings beside the tower at a lower level, is a Craft Museum regarded as one of the finest municipal museums in Ireland. Guided tours of the tower are conducted and there is also a Restaurant on the site.Located approx. 10 minutes walk from Drogheda Rail Station on elevated site.